A lot of work goes into setting up your member health plan portal. Whether you build it in-house or go with a vendor, your organization is making a big investment, both in terms of time and resources. You might be wondering; do we really need to worry about making sure our health portal is “mobile friendly” by adding all these mobile tools? It’s understandable that health plans want to avoid unnecessary costs and implementation. But mobile isn’t a capability that modern healthcare organizations can ignore. In fact, it’s precisely because your organization is already putting so much energy into your portal that you can’t let mobile devices be an afterthought. If you truly want to engage your members and get them to adopt your health portal, you need to think mobile first. What does “mobile first” mean? Thinking mobile first means designing your portal as though mobile access is the preferred way members are going to access it—because they are. A mobile first platform leverages unique mobile functionality like apps and SMS text messaging to get the most out of your system. Any organization that creates online tools has to be mobile first to serve their target audience, because no matter who that is, they’re going to access websites and online tools from a mobile device. As of 2018, 77 percent of Americans own smartphones, including 46 percent of seniors. That’s higher than the percent of American adults who own a laptop or personal computer. Not to mention, almost half of American adults have some sort of tablet. And according to Pew Research Center, “one-in-five American adults are ‘smartphone only’ Internet users,” who only go online via their phones. So, if your health portal isn’t responsive (it adapts to fit the screen of the device being used to access it), and it’s not mobile-friendly (it looks good and performs well on mobile), your member experience will be mediocre, at best. And, likely, they won’t try to use it again. In light of how much work goes into your health portal and the advanced capabilities behind it, you might think that a little zooming and scrolling and squinting sounds like a minor inconvenience. But the reality is, that extra work is all it takes for people to give up on your portal altogether, and that “minor inconvenience” can mean the difference between a good adoption rate and a bad one. You can’t expect people who are used to Internet shopping or connecting to their grandkids on Facebook to adopt a less functional solution when it comes to their health care. People expect more from their online experiences. And that’s why mobile first websites and tools ultimately perform better. As early as 2012—that’s seven years ago—Google found that 75 percent of Internet users preferred mobile-friendly sites. And when people visited a website that wasn’t designed for mobile, 48 percent reported being frustrated and annoyed. Why? Because it was harder to find and do what they needed. And that was seven years ago, when mobile devices were far less ubiquitous. It shouldn’t come as a surprise that if your portal is hard for people to use and navigate on their preferred device, they’ll use your portal less – or not at all. Thankfully, the inverse is true, too. When people visited mobile-friendly sites, 74 percent said they were more likely to return, and 67 percent said it made them more likely to buy that site’s product or service. If adoption rate and usage are important metrics for the success or failure of your health plan’s portal (and they should be), then you need to design everything with mobile in mind. When you think of mobile devices as an asset instead of a problem, it opens up some engagement opportunities. If you go all-in and create a mobile app, you gain the ability to send push notifications that will pop up on your members’ phones even when the app isn’t open. These notifications can link to your app or specific pages of your website, and many health plans use them to drive members to health and wellness-related content, complete basic actions, and eliminate gaps in care. SMS texting, another option, is one of the most effective ways to communicate with your members. These messages can function similarly to app notifications, but there’s an extra advantage: chatbots. Using natural language processing, chatbots can understand the text that members send and select an appropriate pre-programmed response. What does that mean for health plans? You can text questions to your members, and they can ask questions about any text you send. When you need to gather more information from them, you can use SMS to get it fast. And when they need clarification or aren’t sure how much something costs, they can ask. The best part is it’s all automated, so it can happen behind-the-scenes without eating up your employees’ valuable time. 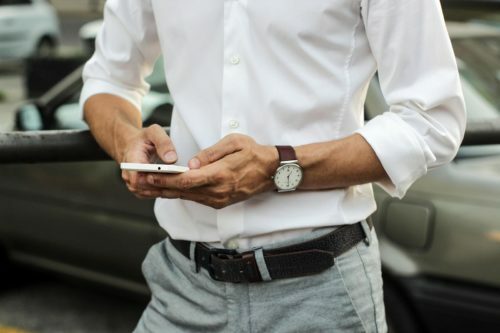 At Healthx, we’ve found that when our customers text their members, an astounding 98 percent of those members view the messages. By comparison, even if your email list has an unusually high open rate, it’s nowhere near 98 percent. Email simply doesn’t get that kind of engagement. Between push notifications and text messages, a mobile first approach to health portals will give you a huge advantage when it comes to engaging your members. You don’t have to wait for them to come to you. You can proactively message them, and since you’re using the most convenient communication channels, you can be confident that they’ll see and act on your message. Most health plans value engagement but they struggle to achieve it. At Healthx, we believe one of the biggest reasons health plans have trouble with engagement is because they neglect the potential of mobile. Coming soon, in our new ebook, Why Mobile Engagement Should Be Every Health Plan’s Secret Weapon, we explore everything you need to know about engaging your members via mobile.